Samsung today announced two new fitness-themed wearables. The Gear Fit2 is a second-generation, wrist-worn activity tracker with GPS and heart rate monitor. Like the original, the Fit2 has a curved, Super AMOLED touchscreen that can be used to track activity as well as check notifications. The device can record workouts automatically, transfer fitness data to Samsung's S Health app, and play locally stored music. The Fit2 runs the Tizen operating system, has a 200mAh battery, and goes on sale June 10. The IconX is a pair of Bluetooth wireless earbuds that are wholly free of wires. Each earbud contains its own 47mAh battery. The carrying case holds another 315mAh battery to recharge the earbuds. The IconX are activated when users place them in their ears. The earbuds are able to track distance, speed, duration, pulse, and burned calorie data; offer voice guidance for feedback during workouts; and store and playback 1,000 songs thanks to 4 GB of internal storage. The earbuds feature capacitive controls to make them easier to use. The Gear IconX will go on sale during the third quarter. Samsung did not reveal pricing details for the new wearables. Samsung today announced several new wearables at IFA. 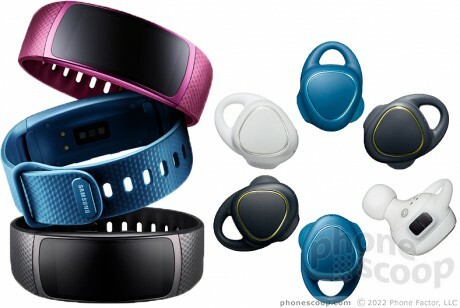 They include the Gear Sport smartwatch, the Gear Fit2 Pro fitness band, and the Gear IconX 2018 wireless earbuds. Samsung today updated its dedicated fitness band, the Fit2 Pro. This wearable features a 1.5-inch curved OLED display and runs Samsung's Tizen operating system.